The Bruce protocol treadmill test is used for estimating the overall fitness of endurance athletes. The test was originally designed by cardiologist Robert A. Bruce in 1963 as a non-invasive test to assess patients with suspected heart disease. In a clinical setting, the Bruce treadmill test protocol is sometimes called a stress test or exercise tolerance test. The test can be used to estimate maximal oxygen uptake (VO2 max), which is a measure of an athlete's capacity to performed sustained exercise. It is linked to aerobic endurance. The Bruce treadmill test is an indirect test that estimates VO2 max using a formula and an athlete's ability to exercise on a treadmill as the workload is increased. Other methods of measuring VO2 max are much more cumbersome and require the direct collection and measurement of the oxygen volume and oxygen concentration of inhaled and exhaled air the athlete uses while running. This collection determines how much oxygen the athlete is using as they run. Clearly, that sort of direct testing would require far more elaborate and sophisticated equipment and data collection that the formula based on time on the treadmill. The Bruce protocol is a maximal exercise test where the athlete works to complete exhaustion as the treadmill speed and incline is increased every three minutes. The length of time on the treadmill is the test score and can be used to estimate the VO2 max value. During the test, heart rate, blood pressure and ratings of perceived exertion are often also collected. Because the Bruce treadmill test is a maximal exercise tolerance test, it is not something to be done without a physician's clearance and expert supervision. In an untrained individual or an athlete with an underlying heart condition, exercising to a maximal effort can lead to injury or potential heart events. 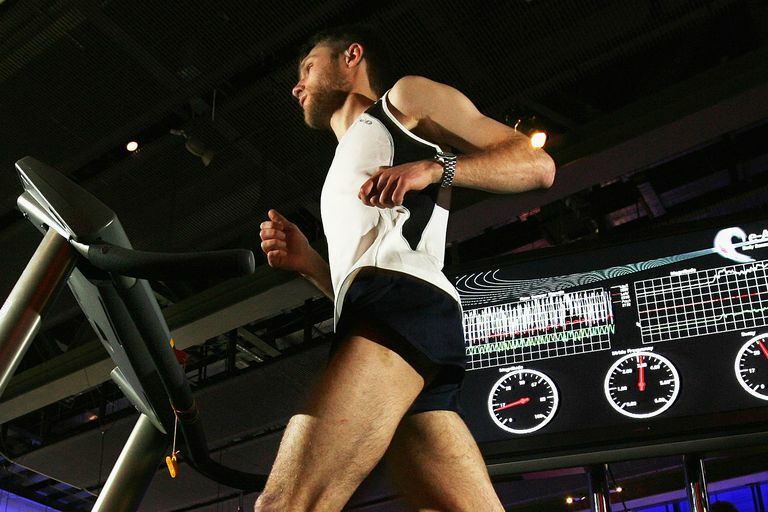 While performing the treadmill stress test, clinicians will monitor the patient's vital signs continuously and stop the test at any sign of trouble. For an athlete, an experienced technician should monitor heart rate and rhythm throughout the testing. Be sure that your testing facilitator has the appropriate clinical expertise and has conducted such tests many times before you step on the treadmill for your own testing. T = Total time on the treadmill measured as a fraction of a minute (a test time of 9 minutes 30 seconds would be written as T=9.5). Heyward VH, Gibson A. Advanced Fitness Assessment and Exercise Prescription, 7th Edition, The Cooper Institute for Aerobics Research, Dallas TX, 2014. Kenney WL, Wilmore JH, Costill DL. Physiology of Sport and Exercise. Champaign: Human Kinetics; 2012.